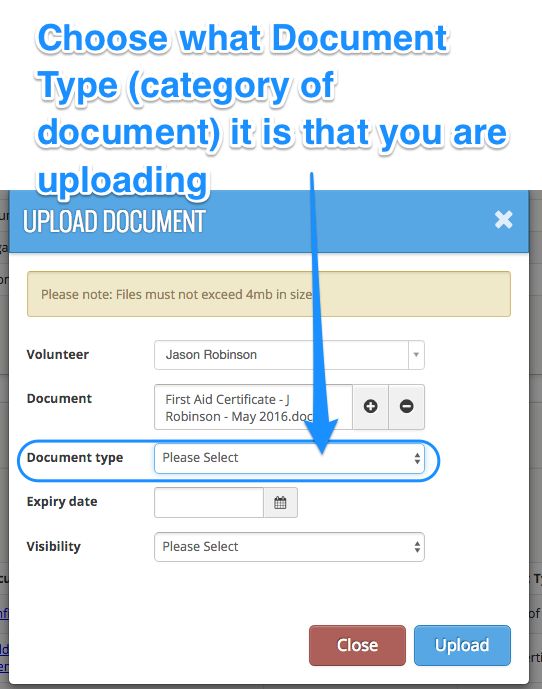 Complyfile — How do I upload an attachment / document to a user’s profile? There are many potential uses. 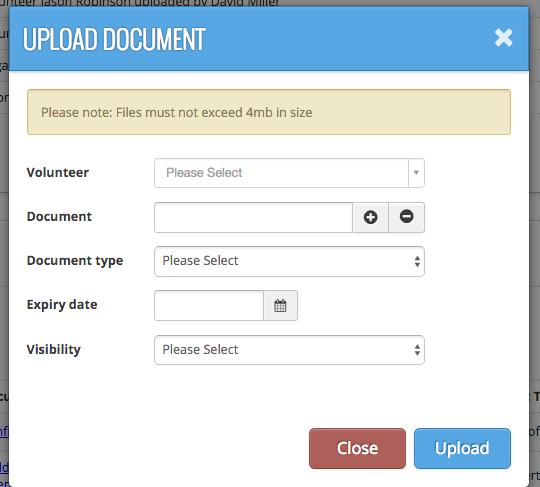 There is no limit to the number of files you can attach to a volunteer's profile. 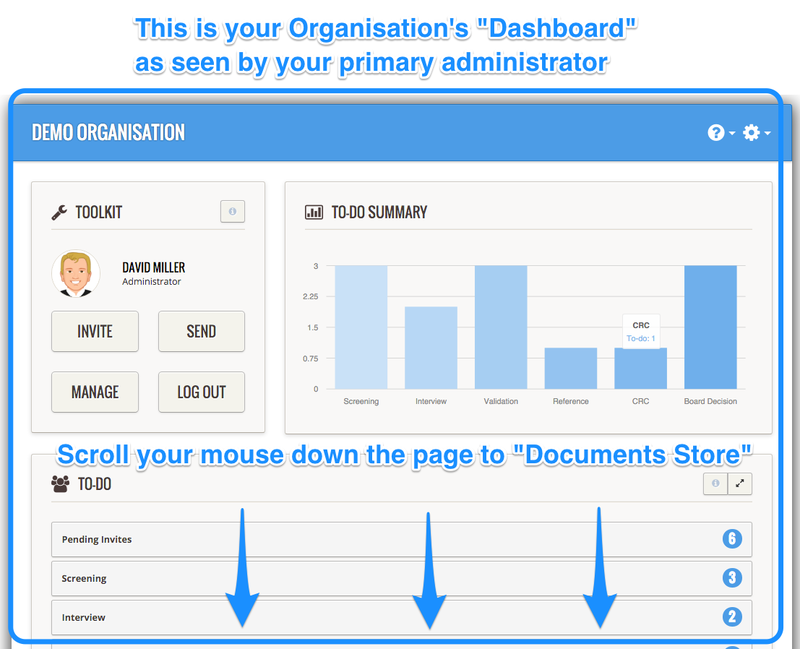 From your organisation's Dashboard (the home page of the application), scroll down to the foot of the page. You will see a section called 'Documents Store'. (Click here to read about how to create a new Document Type). Some documents have a date when their validity 'expires' or needs to be renewed by. 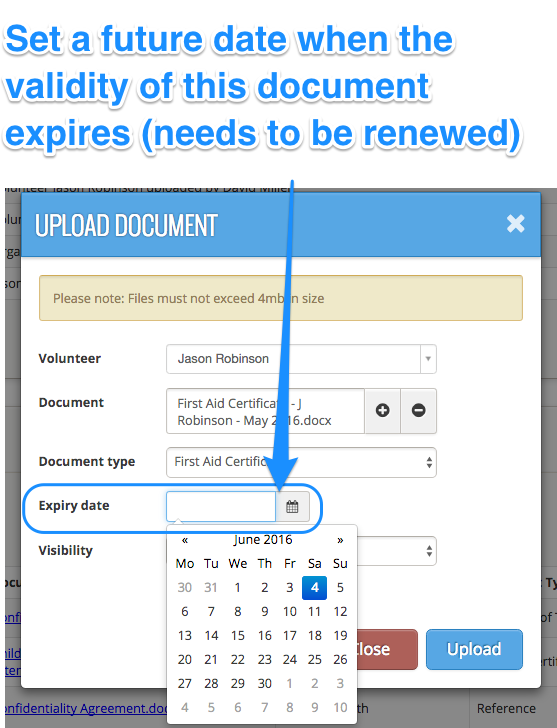 Set an Expiry date if you want to (it's not mandatory), by clicking the field, so that a drop-down Calendar appears). The final thing to do is to set who can view the document. This is a critically important section, so take your time here. internally generated person-specific documents (such as meeting notes, or verification of identity paperwork) would be viewable by the "Administrator Only"
externally generated person-specific documents supplied to you by your applicant should be viewable by both the "Administrator & Only This Volunteer"
In your Complyfile there are three different Visibility Settings that you can give to a document. Select this Visibility setting for a document that you want only an Administrator to be able to see (e.g. interview meeting notes). Giving a document the "Administrator Only" Visibility setting means that the document will only be visible to the Administrator. It will not be visible to the Applicant/Volunteer. but it shouldn't be viewable by anyone else. So an example of this might be a Training Certificate for a course that the applicant has been on, and you want to keep a record of that document on their profile page, and you want the volunteer to be able to view (and perhaps download?) the document when they access their secure volunteer profile page. This Visibility setting is only for documents that you want to be visible to ALL users of your organisation's Complyfile. 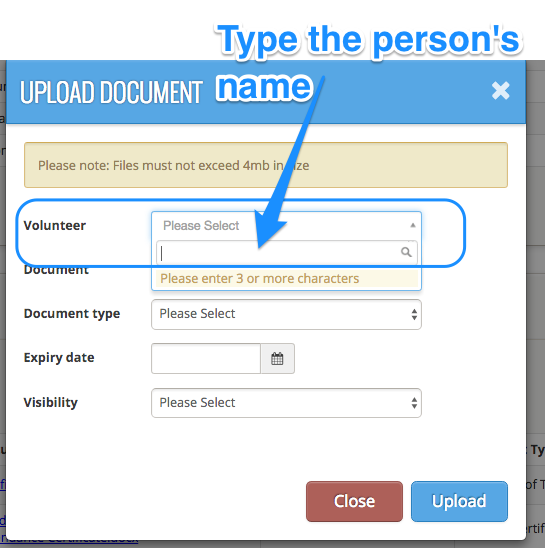 Selecting this Visibility setting automatically attaches the document which you're uploading to the profile page of every single one of your volunteers. 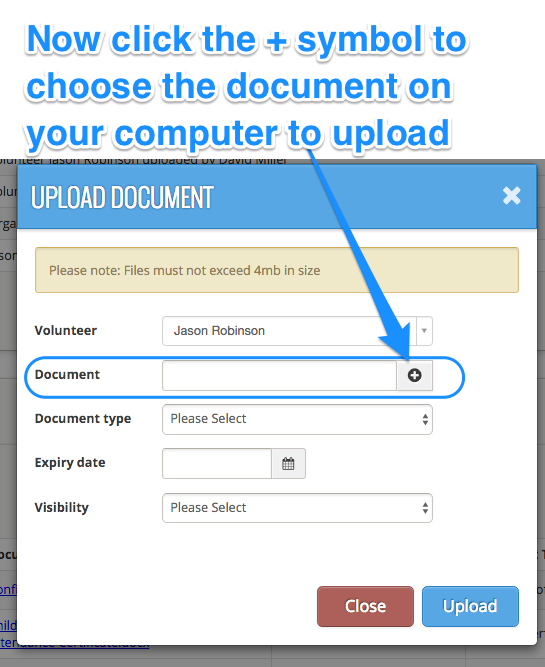 This is particularly useful when you want to make sure that your volunteers have, for example, an up to date copy of your recently revised policies and procedures; or if you want to circulate some form of template important document, which they can securely and easily view and / or download. This Visibility setting ("Administrator & All Volunteers") should ONLY be used for an organisation-wide document. 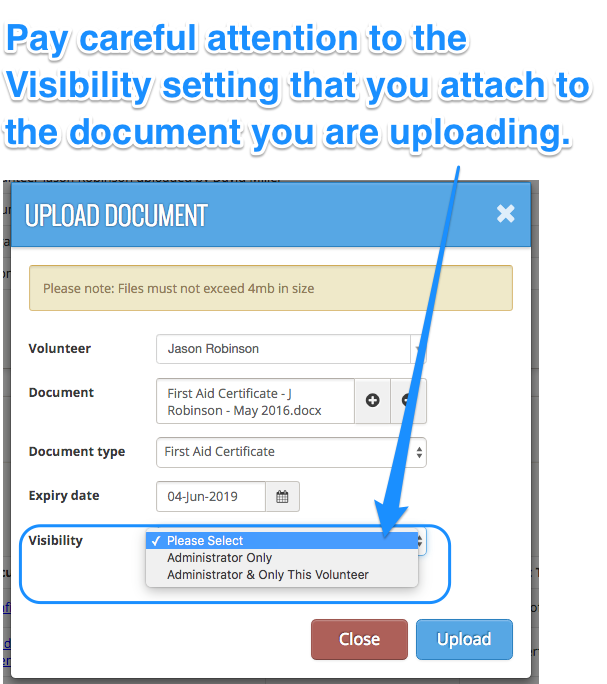 If you use this Visibility setting on a document that is private to an individual, that document will be assigned to - and viewable by - all your volunteers if they are logged in and choose to view it. 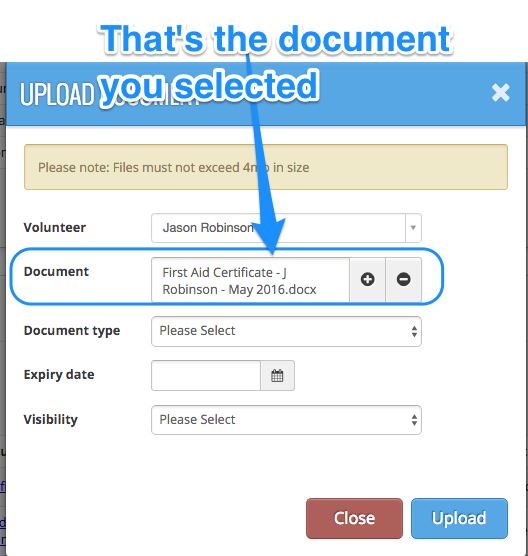 A record is automatically generated of the file upload you just did, in both the Admin Dashboard, and the volunteer's own profile page. Do you know my account password?